Grapefruit is as delicious hot as it is cold - perfect for a warm breakfast on a cold day. 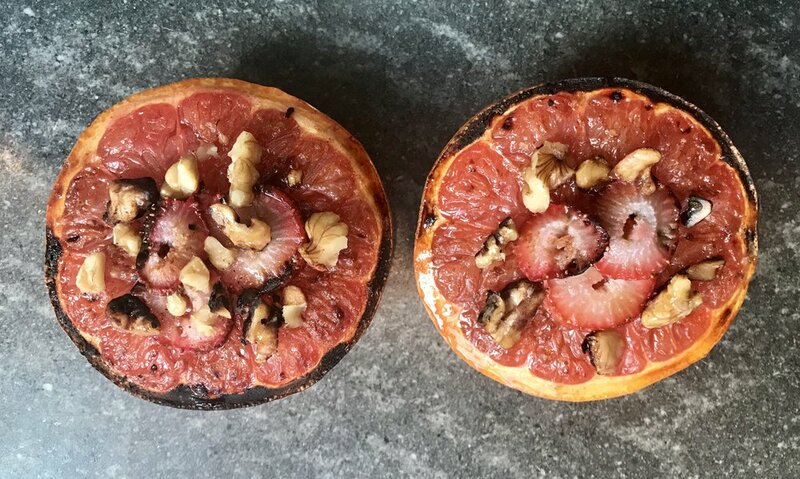 This recipe uses a naturally sweet topping to balance out the citrusy sourness and broiling caramelizes everything a little, melting it into the tangy grapefruit underneath. You can leave out the honey if you like the sourness with your sweet, but even with the honey, this is a super low-sugar way to enjoy this delicious and healthy fruit! Cut grapefruit in half and place on a baking sheet. Sprinkle grapefruit generously with cinnamon. Place strawberries and chopped walnuts on top. Drizzle honey on top of each half (optional). Place the grapefruit under the broiler until slightly browned, about 4-5 minutes. Remove from oven and enjoy while still warm.